After only fleeting or distance glimpses of non-Bald Eagle raptors around Sitka, I seem to have finally made it into the club these last couple of days. Well, the young Sharp-shinned Hawk section of the club, anyway. 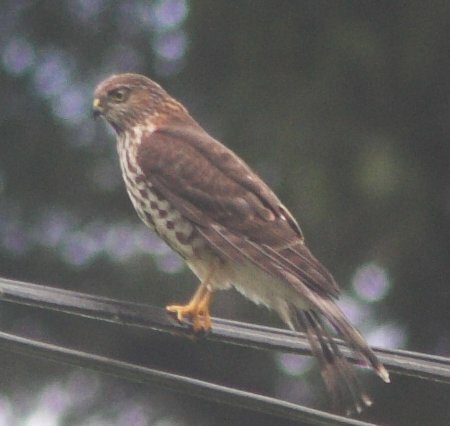 Tuesday, I got my first reasonably close photo of a Sharp-shinned Hawk. Wednesday I had the chance to watch a Sharp-shinned Hawk around our house for half an hour or so (more on that in a moment) and then again at Totem Park later in the day. Friday I saw a hawk on the beach at Totem Park and then over in the estuary. I think all the sightings were probably of the same young hawk. The hawk perched in one of the trees across from the house. It appeared to be carefully watching the front of our house, where it suspected the jay would come back to grab another peanut. The jay landed, grabbed a peanut and flew up to the roof. As it was doing this, the hawk took flight. It glided down toward the jay and arrived shortly after the jay landed on the roof. I saw the hawk reach out its talons as if to grab the jay but the jay only flinched a little bit and might have made a slight call. The hawk pulled out and flew up to a different tree to watch again. 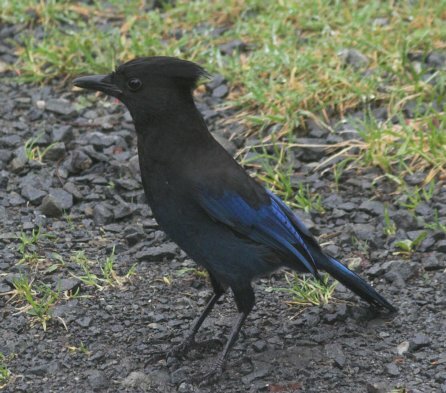 The hawk did not always watch the front, sometimes it would wait in the back, where the jay often hides peanuts. I watched this continue for quite a while before the hawk finally flew off toward the flume. I am not sure if Sharp-shinned Hawks can normally catch jays or not, but it seemed clear that this particular jay was not concerned about this particular hawk. From what I could tell, it did not need to be. I am not sure what the hawk hoped to accomplish, perhaps it really thought it had a chance to catch the jay and eat it. It appeared to have the coloring of a juvenile, so it may just be learning how to be an effective predator.